We all love some breakfast television with your morning cup of coffee. 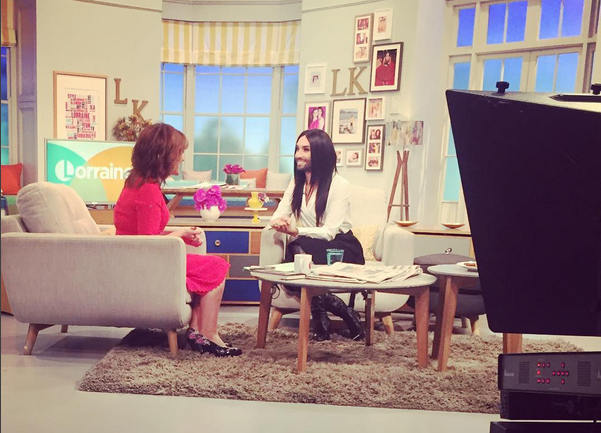 This morning on ITV’s hugely popular breakfast chat show ‘Lorraine’, Eurovision winner Conchita Wurst stopped by for a chat and a song with Lorraine. They talked about how Conchita came to be, Eurovision, Make-Up, Victoria Beckham and tons more. Check it out! Remember that Conchita’s album is on released in the UK this Friday so make sure to get your CD copy. The inlay card is #Amazing too! Have you got your album already? Have you got your book ‘Being Conchita’? Are you #Unstoppable?